Patients at UCLA Mattel Children's Hospital received a special treat from a musical group currently opening for Justin Timberlake. The Shadowboxers, a pop band from Atlanta, recently visited the hospital to play music for patients, families and staff. 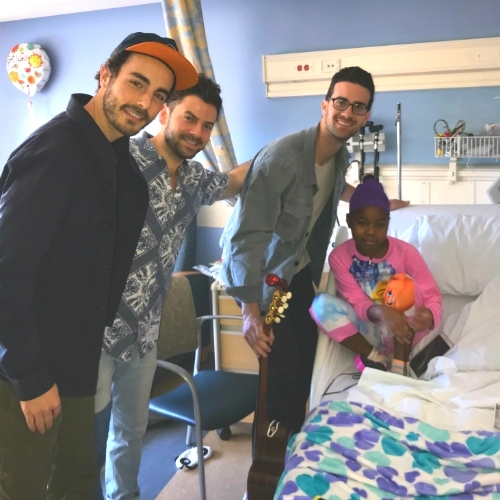 The Shadowboxers’ Adam Hoffman, Matt Lipkins and Scott Tyler strolled through the hallways, stopping in patients' rooms and nursing stations to serenade listeners with guitar music and original songs. The band's performances were met with claps, cheers, hugs, and sing-alongs. "One of the best parts of our job is getting to do things like we did today," Tyler said. "It's really gratifying for us to come to the [hospital] and play for the kids." UCLA Mattel Children’s Hospital staff incorporate music and expressive arts as an integral part of providing comprehensive care to patients. 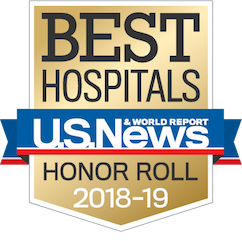 "In our music therapy program, we do a lot of work bedside with patients that focuses on symptom management and provides an outlet for emotional expression," said Jenna Bollard, manager of the Peterson Family Foundation Music Therapy Program at the hospital. "What's really special is when we have amazing visitors from the community, like the Shadowboxers, who bring so much life and joy to our patients here." As the opening act for Timberlake's Man of the Woods Tour, the Shadowboxers have performed in front of packed stadiums across the United States. Performing for the children in the hospital and their families was a special experience, the band members said. "It's one thing to be playing in front of a crowd, and it's a whole other thing to sit in front of one person and make a direct impact with them," Lipkins said. As the bandmates posed for pictures with smiling patients, it became clear that the visit was a hit. "The purpose of writing songs is to spread joy," Hoffman said. "That's the whole reason why we do this."